I was at my wit's end. I'd had enough of this job, this life, and my relationship had broken up. Should I eat chocolate, or go to India, or fall in love? Then I had a revelation: Why not do all three, in that order? And so it was that I embarked on a journey that was segmented into three parts and was then made into a major motion picture. Later, I woke up on an airplane with a hole in my face and a really bad hangover. I was ushered brusquely off the plane by my parents who took me to a rehab where I tested positive for coke, classic coke, special k (the drug), Special K (the cereal), mushrooms, pepperoni, and Restless Leg Syndrome. It was there that I first began painting with my feet. Ugh, okay. None of this is true. 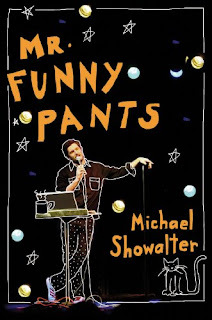 I'm just kind of a normal guy from New Jersey who moved to New York, got into comedy, wrote this book about trying to write this book, and then moved to Alaska, became the mayor of a small town, spent $30,000 on underwear, and now I'm going to rule the world!!! Michael Showalter is the star/creator of Michael & Michael Have Issues, The State, Wet Hot American Summer, The Baxter, Stella, Die Hard* and Die Hard 2: Die Harder**. He lives in Brooklyn with his lady and a bunch of cats. Pure Genius! I never knew you could be sarcastic and earnest at the same time. This is one of the funniest celebrity pseudo-memoirs I have read in a long time Anyone who hides their guilty pleasures in music on their iPod by labeling them really cool and hip indie bands, has my vote. I would do the same thing, but I have quite figured out how to do it. Michael Showalter pokes fun at the seriousness of writing by making fun of some of the things "serious" writers do like the preface only he takes his to the third level by having a post-preface. Oh and you can't forget the afterword, the after-afterword or the just-before-the-afterword. This is really a book that you should leave out on your coffee table since there are so many fun things to do like a fill in the blank romantic-comedy plot and the one minute mysteries. You can easily reread this several times. There are also little bits and pieces of the author's life and what junior high meant to him. There are some other important things, but I forgot them. I think they had something to do with drinking games, which is probably why I forgot. I received this book at no charge from the publisher in exchange for my honest review. This giveaway is sponsored by Grand Central Publishing and up to two copies of the book will be available. Only one winner per household address! This looks right up our alley! I think I remember one minute mysteries. Thanks for the info & chance to win. This guy sounds really funny! So there I was in the 50's, vacuuming in my pearls and sensible pumps when I looked outside and realized it was 2011 and there were 14 inches of snow to move, due to El Nino/Nina/global warming, take your pick. An email has been sent to the lucky people named above (first part of their email address in case my note ends up in spam). The winner(s) has 48 hours to respond or a new winner will be chosen.